March's update brings you something rather different from our usual marquetry themed fare. The colour and texture certainly look like marquetry work, but this time we are dealing with a Gothic style of oil painting. Our March update brings you a painting for a change which at first glance gives the impression of being a marquetry picture. It is the property of Alex Davidson and was sent in to us to see if we could furnish any information about it for its owner. Unfortunately we are marquetry experts and not art specialists as such. 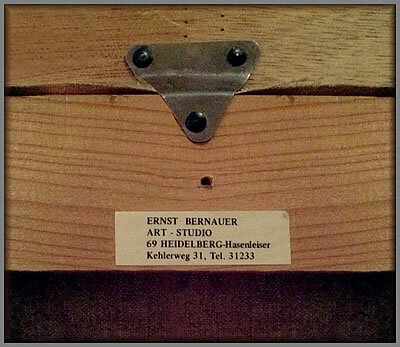 This picture has a label on its rear which indicates that it originates from a well respected Buchschmid and Gretaux Wood Inlay Company agent in Heidelberg who goes by the name of Ernst Bernauer. Of course the more familiar agent we usually associate Buchschmid and Gretaux with is Herr Otto Chlup's ABC Studios of Heidelberg, but they also used several other agencies to supply their wood inlay work through. 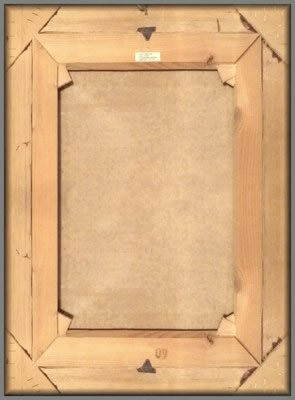 The Ernst Bernauer Art Studio obviously supplied more than wood inlay work through their agency, this painting proving that point. 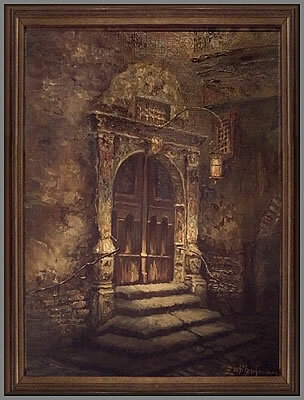 Sadly the Ernst Bernauer Art Studio no longer seems to exist, so we can gain no useful information from that quarter, so in our review of this picture we have to rely on our own assumptions. Well first off, we checked the artist's name which looked to us like "Zuhihsy" - but of course we could find no reference to such a name anywhere. The style of the work is pure Gothic, and from the texture it could be an oil painting or an acrylic painting; they both allow impasto work. The rear view of the picture show a close weave canvas which looks reasonably clean and not too old. The frame and stretcher also appear to be in clean and not too old condition. The corner braces also appear to be hardboard (Masonite) and fixed in places with staples. If any of you have an idea of who painted this picture we would love to hear from you. Click the above button to return to page 52 of "Can You Help"